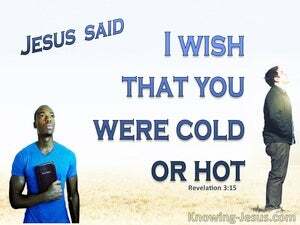 ﻿ Revelation 3:15 'I know your deeds, that you are neither cold nor hot; I wish that you were cold or hot. I know your works, that you are neither cold nor hot. I wish that you were cold or hot. "I know your actions, that you are neither cold nor hot. I wish you were cold or hot. I know thy works, that thou are neither cold nor hot. O that thou were cold or hot. I know your [record of] works and what you are doing; you are neither cold nor hot. Would that you were cold or hot! 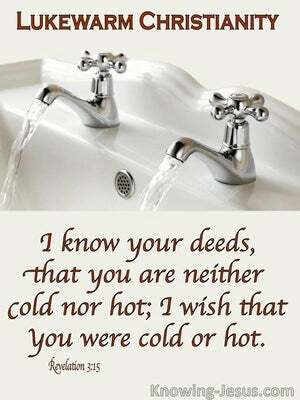 I know about your deeds, that you are neither [spiritually] cold nor hot. I wish you were [either] cold or hot. I know your works, that you are neither cold, nor hot: I wish that you were cold, or hot. I have knowledge of your works, that you are not cold or warm: it would be better if you were cold or warm. I know your works, that you are neither cold nor hot. I could wish you were cold or hot! I know your works, that you are neither cold nor hot: I wish you were either cold or hot. I know your works, that you are neither cold nor hot. I would that you were either cold or hot. I know what you are doing, and that you are neither cold nor hot. I wish you were either cold or hot! 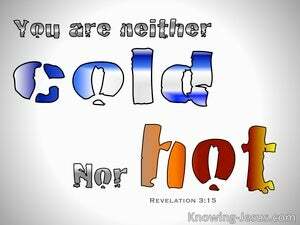 I know thy works, that thou art neither cold nor hot: O that thou wert cold or hot! I know thy works, that thou art neither cold nor boiling: I would thou shouldest be cold or boiling. 'I know your works, that you are neither cold nor hot. Would that you were cold or hot! I know your works, that you are neither cold nor hot. I would that you were cold or hot. I know thy works, that thou art neither cold nor hot. I would thou were cold or hot. 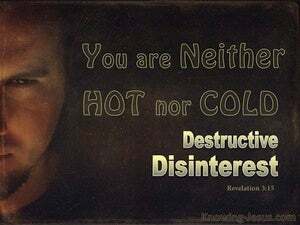 I know your doings, you are neither cold nor hot ? ?would you were either cold or hot! I know your works, that you are neither hot nor cold. I know your deeds, that you are neither cold nor hot. I wish you were either cold or hot! "I know your works, that you are neither cold nor hot. I wish you were cold or hot. I know your works, that you are neither cold nor hot. I wish you were cold or hot. I know thy works; - that neither, cold, art thou, nor hot: I would that, cold, thou hadst been, or hot. I know your life; I know that you are neither cold nor hot. Would that you were either cold or hot! I know your doings--you are neither cold nor hot; I would that you were cold or hot! "I know what you are doing, and that you are neither cold nor hot. I wish you were cold or hot. "I know your works, that you are neither cold nor hot. I would you were cold or hot. I wish thou wert cold or hot. 14 "To the angel of the church in Laodicea write: The Amen, the faithful and true Witness, the Beginning of the creation of God, says this: 15 'I know your deeds, that you are neither cold nor hot; I wish that you were cold or hot. 16 'So because you are lukewarm, and neither hot nor cold, I will spit you out of My mouth.